Vivienne Westwood Mainline an inspired take on traditional evening wear, this, double-breasted style, cropped Frock Coat (jacket) is notable for its styling. 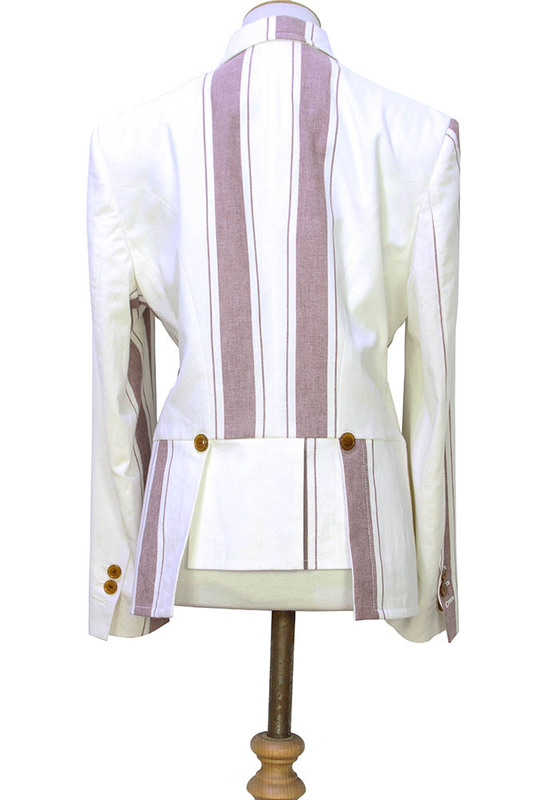 Sharply tailored from white cotton, with pale pink stripes inspired by classic stripy tea towels, the coat is finished with peak lapels and triple vented at the rear with button details. Left chest pocket. 3 button cuffs with the usual two working and one unfastened. Sides longer than the front and rear. Combines beautifully with the trousers in the same fabric to create a wonderful Summer suit.